Food allergies and sensitivities can be stressful if you’re suffering from them but knowing the difference between food allergies and sensitivities can help make food choices easier. 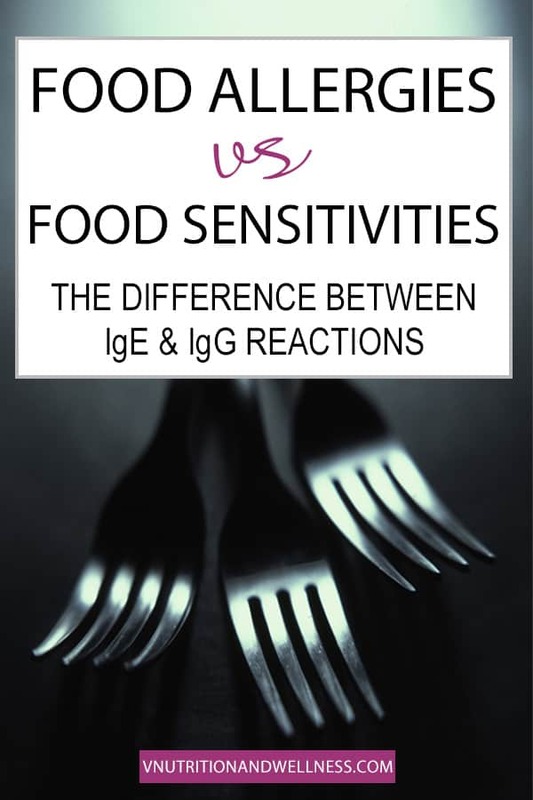 Find out how IgE and IgG food reactions differ. Food allergies are a big part of nutrition. Our bodies can react to foods in many different ways. Foods that can be “good” or “healthy” for the majority of people, could cause problems for others if they have an allergy/sensitivity/intolerance to them. Immunoglobulins (also know as antibodies) are proteins made by our immune system to fight antigens such as bacteria, viruses, and toxins. These antibodies are produced by our bodies in an immune system response to things we have come into contact with that the body recognizes as foreign (also called antigens), such as viral cells and bacteria. These antibodies are also able to respond to other foreign matter including pollen, dust, dander and foods. Antibodies work to help the body fight against “invaders”. The body makes different immunoglobulins to combat different antigens. There are 5 classes of immunoglobulins, however I’m going to focus on 3 of them because they relate to nutrition. Immunoglobulin E (IgE) – usually an immediate response to a foreign substance that has entered the body. Immunoglobulin G (IgG) – usually food sensitivities and are subtler and can last longer than the traditional IgE allergy. Immunoglobulin A (IgA) – plays a role in the immune function of mucous membranes. IgE (Immunoglobulin E) allergies are immediate responses to an antigen that has entered the body. One example of an IgE response to a food allergy is with egg. If a woman with an egg allergy eats an omelette, B cells (white blood cells that are a part of the immune system) make IgE antibodies to bind to the egg because her body sees the egg as a toxin, not as food. After being exposed to this allergen, IgE antibodies attach to mast cells, where the antibodies stay until the next exposed to egg. When the woman again comes in contact with egg, the IgE antibodies have the mast cells to send out histamine and other compounds which cause symptoms like inflammation and itching. IgE food allergies usually do not go away but can decrease over time if an individual’s health improves. The stronger the immune system and the healthier the gut, the better your body will be able to tolerate accidental exposure. In general though, it’s best away from any food you are completely allergic to. IgE tests are performed as part of an initial screening for allergies or for confirmation of an allergy. This can be done by skin prick or patch testing. The test measures how much IgE is present in a person’s blood. IgG (Immunoglobulin G) food allergies are delayed food allergies. They are often called food “sensitivities”. With IgG reactions, the immune system produces IgG antibodies which can lead to inflammatory processes. Symptoms for IgG reactions can appear up to three days after the consumption of a problem food. Many people with IgG food sensitivities do not realized they have them for years, if not their entire lives. Often it is difficult to pinpoint exactly which food causes problems because of the delayed appearance so tests or an elimination diet can help (more info on this below). Elimination of IgG-positive foods can often improve symptoms of irritable bowel syndrome, autism, ADHD, cystic fibrosis, rheumatoid arthritis, and epilepsy, according to numerous clinical studies. Symptoms for IgG reactions are usually much more subtle and can last much longer than the traditional IgE allergies. The IgG antibodies lead to inflammatory processes and are not associated with the release of histamines so you will not get the immediate hypersensitivity reactions of itching, hives, swelling, etc. Also dark under-eye circles even when well-rested can indicate a negative liver response to a food (especially in children). IgG sensitivities are often associated with many digestive problems including leaky gut (aka intestinal permeability). If you have intestinal permeability it means there are microscopic holes in the lining of your small intestine allowing food particles, toxins, and bacteria to escape into the bloodstream which then puts a burden on your immune system. Leaky gut may trigger inflammation and changes in our good gut bacteria. Many studies now show that changes in intestinal bacteria may play a role in the development certain chronic diseases. Chronic, prolonged inflammation and toxicity can be a cause of autoimmune disease and other related disorders. It is often difficult to pinpoint exactly which food cause problems because of the delayed appearance of IgG symptoms. Because of this, an IgG test is the best way to find out foods you are sensitive to. Many practitioners are starting to do IgG testing. I recommend Genova or Great Plains but check with your healthcare provider on which they use. Once you know the foods that your body will have a reaction to, an elimination diet will follow to avoid foods for a certain period of time (usually about 3 months). During that time you would not eat the offending food. A certified/licensed nutritionist can walk you through exactly how to do an elimination diet and follow with a proper gut-healing program to strengthen your immune system. After this period and gut healing, you can do a re-test with the lab or your nutritionist can help you to “challenge” these foods to see if there are any sensitivities left. After healing the gut, many food sensitivities could go away, and you can reintroduce the foods back into your diet in moderation. If possible, I would suggest everyone get IgG tested for food sensitivities so they know what foods work for their body and what foods could cause problems. While IgA reactions are not directly related to food allergies and sensitivities, we talked about leaky gut briefly so I thought I’d mention another test having to do with intestinal permeability. IgA (Immunoglobulin A)/Secretory IgA (sIgA) is found in high concentrations in the mucous membranes like those lining the respiratory passages and gastrointestinal tract. Secretory IgA (sIgA) provides protection against potentially harmful microbes. It is the body’s first line of defense against bacteria, food particles, parasites and viruses. Chronic stress, frequent antibiotic use, as well as an overload of foods like soda, coffee, alcohol, or sugar can thin the lining of the gut. A Secretory IgA (SIgA) test checks to see how strong or thin your gut-lining is. This will show a person’s ability to defend against infections, allergies, and food reactions as well as provide insight into next steps in treatment of health issues. While food allergies trigger the immune system, food intolerances do not. A food intolerance, however, can cause some of the same symptoms as a food allergy/sensitivity, so people often get them confused. Food intolerances are usually caused by a deficiency/absence of an enzyme needed to digest/process a food. People with lactose intolerance do not have enough of the enzyme lactase that is needed to break down the sugar lactose found in cow’s milk. People with a histamine intolerance could be lacking the DAO or HNMT enzymes which lead to an excess of histamine. If you have a certain food intolerance, you may be able to prevent an issue by adding in certain enzymes that are deficient. By doing this, you might be able to eat small amounts of the problem food. Histamine intolerance is a little different than other food intolerances because of the buildup of histamine. It’s best to stay away from these foods until histamine is lowered. Check out my post for more information on What is Histamine and the foods that contain the most histamines. Food intolerances do not have a specific blood test because the immune system is not involved and immunoglobulins will not be present in the blood. Some people, however, are more prone to intolerances because of genetic polymorphisms (aka variations in DNA) called SNPs (single nucleotide polymorphisms). When someone has a SNP, they may need more help nutritionally for their biochemical processes to work as efficiently. In the case of histamine intolerance, DNA testing could be done to see if you are prone to impaired histamine processing. If any of these genes are slowed, then the removal of histamine could be slowed and symptoms of histamine intolerance can occur. To test for SNPs you can do DNA testing with companies like 23andMe. The raw data files can be looked at by a health care professional or qualified nutritionist who can assist you with support in these areas. Please note: just because you have a SNP does not mean that the gene is turned on and is causing problems. All of us have SNPs so it’s best to speak with someone who is knowledgeable about SNPs before worrying too much about what you find in the testing. 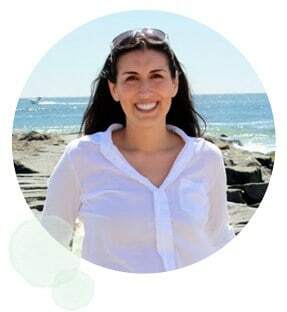 If you have food allergies, sensitivities, or intolerances and are looking for help nutritionally, I offer one-on-one consultations. interesting article – I find it hard to work out the difference between allergies and intolerances so this helps. I read an interesting article the other day about biology being hard to understand because it has evolved over a long time and reacted where necessary so it is not always the way it would be if designed all at once which was an interesting way to think about why bodies are so mysterious.